Shepherd’s Corner donates at least 60-65% of the produce harvest to local food pantries and groups who provide food to those in need. Over the past nine years, Shepherd’s Corner has donated more than 23,920 pounds of naturally grown produce. We are proud to provide fresh, chemical-free, naturally grown produce to our greater community. If you wish to purchase other items (eggs, maple syrup, basil garlic vinegar, bee smooth hand cream, knitted sheep bags, sheep or chicken towels, small wooden cutting boards, bottle stoppers, coasters, baskets, firewood) contact us for a time to stop at the barn. As a note we are generally open for visitors April- November on Wednesdays, Thursdays, and Fridays from 10:00 am to 4:00 pm. Dates where we are not open are listed on our website’s events calendar. Periodically we may hold farm stands, featuring our produce, here at the ecology center. 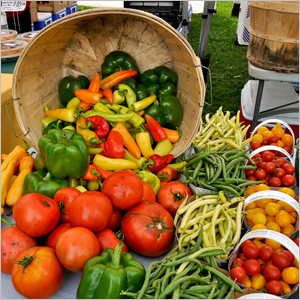 When there are farm stands scheduled, a post will be made to our website and Facebook pages. Our next farm stand will be held on August 28th from 4:00 to 6:00 pm. We also produce maple syrup on site. From tapping the trees, to collecting sap, and boiling down on an evaporator. We even bottle our syrup on site! Here is a video on the production of our maple syrup.